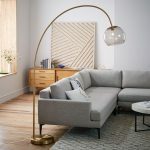 Top 5 Interior Design trends for 2019! 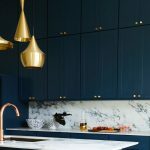 Interior design is taking a dip into the big deep blue this year, with a ‘Blue Planet’ theme becoming a definite trend for the year. 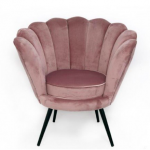 Upgrade your furniture to magical mermaid scalloped chairs and art-deco curved plush velvet beds. 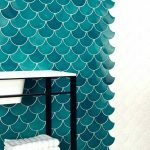 Make waves in your Bathroom, with fish/mermaid scale tiles and create a stunning ‘curvy’ feature wall. 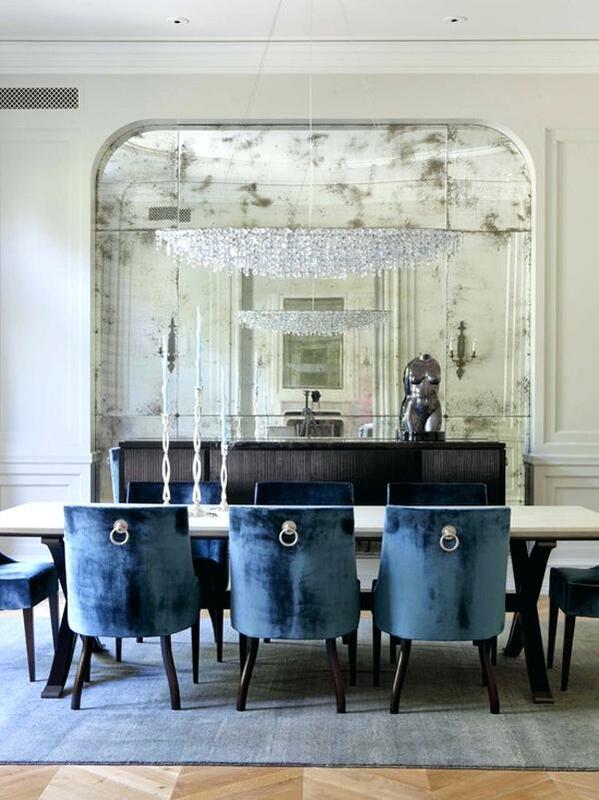 We cannot lie, we’ve definitely fallen hook, line & sinker for this unique new trend. 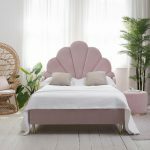 This trend doesn’t just work for bedrooms but for many other features of a home. 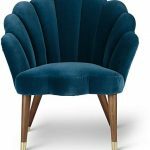 Whether you want to implement this design trend throughout the dining room, living room or even in the bar with matching coloured Bar Stools. 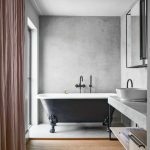 We can see rich midnight blue and dark tones, paired with constellations and galactic patterns appearing in the not-so-distant future. 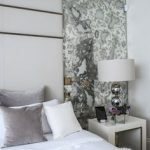 No need to search the sky for inspiration, this decadent trend can be applied to any space, by incorporating elegant astronomy and zodiac patterned wallcoverings, star-strewn crockery, galactic furniture surfaces and cosmic tiles. 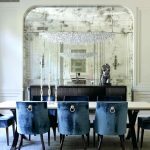 Whether it is subtle starry additions or celestial statements, cosmic trends have been shooting across both interiors and fashion! 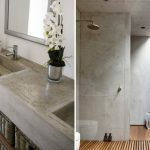 Concrete is definitely the new marble for Bathroom interiors this year. 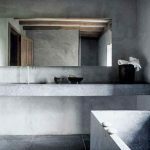 Aesthetically providing a minimal, modern and industrial feel but practically providing a strong and versatile, functional material for a tough, waterproof and durable surface. 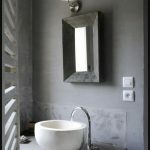 Make it your own by printing on concrete or by polishing it, to achieve a sleek and smooth finish. 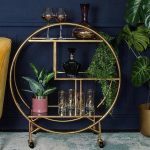 This trend is easily personalised by adding and swapping either bright or natural and raw styled accessories! 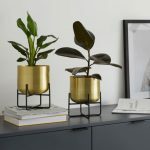 Warm brass tones achieve a warm and timeless but industrial look. 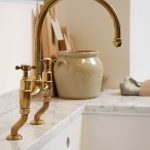 Brass metal fixings and features can be introduced in a number of simple, yet ultra stylish ways. 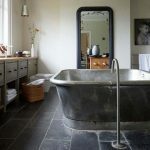 Whether it be a new tap fixture for your Bathroom or Kitchen, simply a new decorative bowl or plant pot or your pendant and floor lighting; this trend is classic and classy, achievable at any level, in any space. 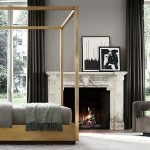 We personally love the contrasting combination of soft brass metal tones, paired with dark, bold navy wall-coverings & we are sure this scheme will be popping up on many occasions throughout this year! 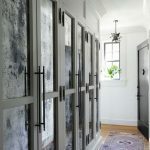 Mottled glass mirrors (also known as antiqued or foxed glass/mirrors) are predicted to be featuring in all different aspects of interior design this year. 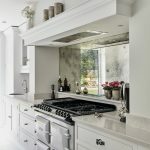 From mirrors to wall panelling, to wardrobe doors, to kitchen & bathroom splashbacks; mottled mirror glass is a staple trend for 2019. 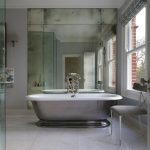 The mysterious textured appearance, creates depth, cosiness and intrigues the eye, with patchy faded reflections. 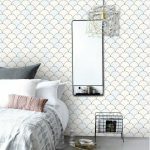 Despite the slightly ‘old-aged’ look, the timeless material of mottled mirror still creates a sophisticated and classy atmosphere, from the chic silvered background. 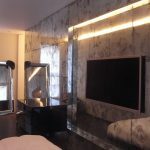 Using this reflective material for large surfaces creatively produces a maximised perception of space, whilst preserving an intimate and warm atmosphere of a room!